PalTalk is quite quality chat service which can be used with program. If you would like to use PalTalk you should download to program first which is about 14 MB. After installment of PalTalk, you are ready to use it. A registration is required for this chat service. There are good features of PalTalk and there’s no premum account need to use this instant messenger. connection with him / her anytime. PalTalk is also offers Video Chat Rooms, Video Conferences their users. You can use PalTalk in mobiles too. If you don’t know English, don’t worry… You can use PalTalk almost in very languages. So there’s no language problem in PalTalk. 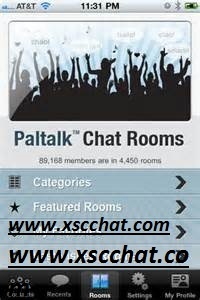 Another good feature of Paltalk is you can add interactive chat rooms to your site or blog. PalTalk doesn’t require any cash for this feature. PalTalk offers you high video quality in webcam chats and permanent friendships.